I have been examining the early history of my group UFOIC – the UFO Investigation Centre based in Sydney, NSW. Formed in November 1956 from the remnants of Edgar Jarrold’s founding group AFSB (Australian Flying Saucer Bureau) (1953-55) and its immediate successor AFSRS (Australian Flying Saucer Research Society) NSW branch (1955-56), UFOIC continued in various forms through to today – 50 years later. I became a NSW north coast member in the late 1960s, but only joined the UFOIC committee in 1975. This focus on the 50 year history of UFOIC (1956-2006 and beyond) had some fascinating and potent resonances with my recent detailed explorations of the Chinese UFO experience. My 2005 trip to China, led to many deep connections with UFO research there as well as the wider dimensions of the controversy in China. (I followed that up with a research trip into Thailand and China in 2006). Inevitably with the profound depths of history in China I also reflected on any earlier intersections of western ufology with Chinese manifestations. 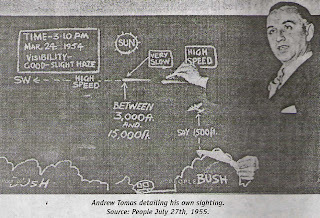 An unexpected intersection came with the early history of UFOIC, in the person of Andrew Tomas (1906-2001), of whom I wrote an obituary for the Ufologist (Vol.5 No.6 2002). Andrew Tomas became a key associate of Edgar Jarrold’s pioneering group back in period from 1953 to 1955. Originally from Russia, he came to Australia in 1948, as part of the stream of people fleeing the turmoil in China, a place he had spent considerable time in particularly exploring the mysteries of the orient. In 1935 he met his spiritual mentor, a fellow Russian, the mystic artist and explorer Nicholas Roerich, in Shanghai. Roerich was lecturing and it was his description of a strange experience in August 1927 in northern China that captured Tomas’ attention and anticipated an obsession to come. Roerich had no immediate explanation for what he and his fellow travellers had seen. When Andrew Tomas met Roerich in Shanghai in 1935 he suggested the aerial object was an “aircraft or spacecraft from Shambhala”. Shambhala was the hidden civilisation than Roerich, Tomas and others spent much of their lives seeking – simplistically captured in the classic book “Lost Horizon” (1933) and the 1937 movie of the same name, which immortalised the myth of the hidden paradise of Shangri-La. 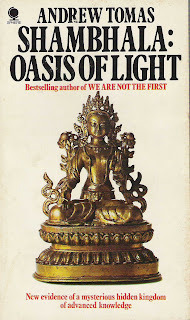 Tomas would return to this theme and the 1927 incident in some of his books, particularly “Shambhala: Oasis of Light” (1977). Some points have become confused, not the least the year it occurred in. Many suggest 1926, but it in fact occurred in 1927. Roerich himself would change his perception of the strange big bird that heralded the unknown aerial object. In his book “Shambhala – In search of the new Era” (1930) Roerich calls the bird a vulture. I found it bizarrely coincidental that another strange bird figured in further 1927 events in a UFOIC investigation I undertook which focused on the small settlement of Fernvale, in northern NSW. Fernvale was haunted by giant bird like creatures, UFOs, and other bizarre events in an extraordinary mirror of events that would be played out again 40 years later in West Virginia USA, which in turn have been popularised in John Keel’s UFO-gothic classic “The Mothman Prophecies” (1975). The 1927 events near Murwillumbah, NSW, and indeed the Chinese Shambhalic apparition and others, prefigured the modern birth of the UFO controversy in 1947, and thus I call it “the 1927 prophecy”.